Astrobites is seeking new graduate students to join the Astrobites collaboration. Please share the information below with your graduate student colleagues. Applicants must be current graduate students. The deadline for applications is November 15, 2018. Please email hiring@astrobites.org if you have any questions. Come join us! The hiring committee will review submissions based on the quality of their sample astrobites and their responses to the two short essay questions. The names and affiliations of the applicants will be concealed from the hiring committee until after the final list of candidates is selected to promote equity. Successful candidates will be notified approximately one month after the application deadline. Upon submitting an application, applicants will receive a confirmation email and a link to a brief survey. This optional survey will ask questions concerning demographics, etc. – this information will not be associated with the application in any way. We ask that applicants please participate in the survey, so that we at astrobites can further understand our applicants’ backgrounds and promote diversity among the astrobites team in the future. 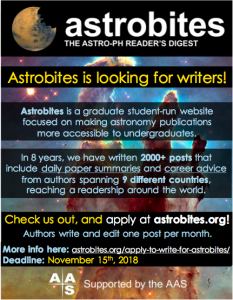 Go to https://astrobites.org/apply-to-write-for-astrobites/ for the application.